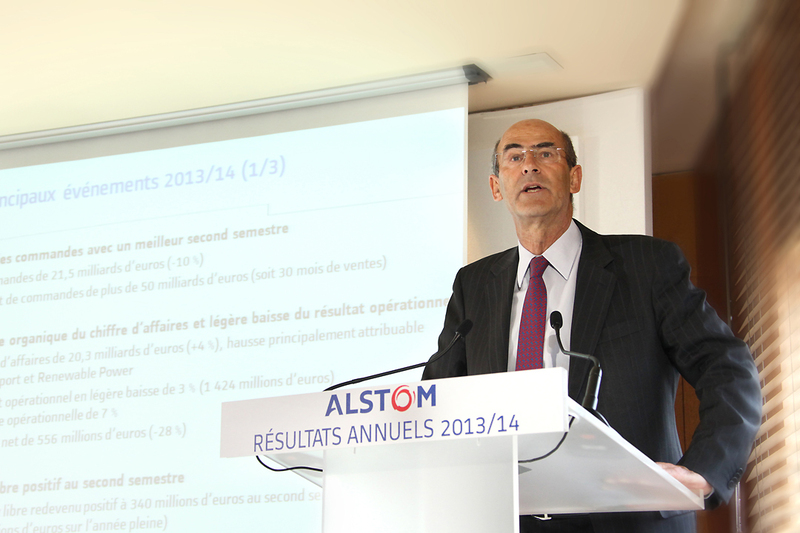 Between 1 April 2013 and 31 March 2014, Alstom booked 21.5 billion of orders, down 10% compared to last year. Sales, at 20.3 billion, showed a 4% organic growth compared to last year. Income from operations amounted to 1,424 million, down 3%, with a 7% operating margin. The net result decreased from 768* million in 2012/13 to 556 million, affected mainly by higher restructuring and financial charges as well as some specific write-offs and provisions. The free cash flow has been positive in the second half of 2013/14 with 340 million generated, after the 511 million outflow in the first half. No dividend distribution will be proposed at the next Annual General Meeting. Alstom delivered a better commercial performance in the second half allowing the Group to end the year with a book-to-bill ratio above 1. Sales were up 4% organically driven mainly by the strong performance of Transport and Renewable Power. The operating margin, at 7%, benefited notably from a favourable mix in Thermal Power, continuing progress of Transport results and the impact of our Performance Plan, d2e. Free cash flow has been positive in the second half, partly offsetting the significant outflow of the first half. Alstom received last week a binding offer from General Electric to acquire our Energy (Power and Grid) activities. The Group has retained the possibility to consider unsolicited alternative offers that may be deemed superior. Should this project be approved and completed, Alstom would refocus on its Transport activities, said Patrick Kron, Alstoms Chairman and Chief Executive Officer. For more information, click on downloadable pdf version of the release on the right column.